Just About Anything: Ah, the Smell of Salt! Marseille, France is the oldest city in France and the second most populous city next to Paris. 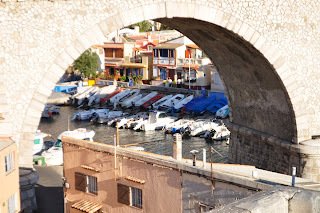 It is located on the south east coast of France on the Mediterranean Sea and is France's largest commercial port. And because it is near the sea, the view is just breathtaking. A view of the Old Port (Vieux Port) from the Basilica of Notre Dame de La Garde. It has been a while since I have been to the beach. The last time I was at the beach was last December when we visited my brother in law and his family in Bournemouth for the Christmas holidays. But it was winter and so I did not really got to "bask in the sun and sand". The War Memorial on the Corniche. This is the Vallon des Auffes, a picturesque fisherman's village nestled in a little creek. Nanay and Tatay taking in the view of the Mediterranean Sea. The locals bathing off the Corniche. This looks very much like in Palm Beach, or what? The replica of David, standing proud at the roundabout. Our hotel is just close to the coastal road and then the long stretch of beaches. 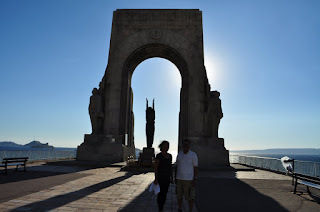 And I made sure that we pass by La Corniche, the road that follows the sea, which begins from the Catalans (just behind the Pharo at the entrance of the old port) to the enormous marble statue of David some 3.5km further East. There were lots of things to be seen while driving through this road and there lots of small parking spaces available if you want to stop for a while to take some snaps. Who says only celebrities can be photographed by paparazzis? I loved the smell of the cool breeze of the sea and the smell of salt in the air. I loved the taste of the salt on my lips and the sticky feeling that one gets after a day of being out in the beach. And I loved the feel of sand and and soft pebbles on my feet. Ah yes, the smell of salt and the sea is just wonderful! Looks more like Santa Barbara with the mountains.